When the Expedition arrived on the scene in the mid 90s it was a dream come true for families who didn't want to settle on driving a minivan or cookie-cutter SUV. Over a decade later, families who drive the 2013 Ford Expedition in Phoenix will tell you the same thing - this SUV remains a dream come true for anyone who really needs ample cargo volume, room for up to eight passengers and large SUV power. The standard Expedition at Peoria Ford offers terrific interior volume, and for those who need even more space, the 2013 Expedition EL (extended-length) model delivers just that. Peoria Ford is your headquarters for 2013 Ford Expeditions in the Phoenix metro area. Check out a full review of the Expedition below for details about everything from its safety technologies to its engines, trim levels and more! Then, if your interest is piqued, come down to Peoria Ford at W Bell Road and N 91st Avenue to see if it's the right fit for your family! Check out the 2013 Ford Expedition to versus similar autos like the 2013 Toyota Sequoia, Dodge Durango, Buick Enclave and the Chevrolet Tahoe, and you will notice that the 2013 Expedition trumps those vehicles in numerous areas. Get a load of the reasons see why! Our Ford dealership in Phoenix is quartered near a number of local cities! So, you're a brief spin away from receiving trustworthy OEM parts and work from Ford technicians! We also supply a generous warranty on repairs! If you ignore preserving your Expedition, its stamina could be jeopardized, so drive it to Peoria Ford's service center in Phoenix. Just a portion of the jobs our Ford repair mechanics do includes windshield wiper replacement, muffler repair and easy ordinary inspections. Also, you can look forward to inexpensive service at our Ford auto repair center in Phoenix. Find unbelievable service coupons at Peoria Ford by clicking below this text! Peoria Ford is home to the 2013 Expedition! For yet another year, this popular full-size SUV offers large families everything they could ask for in a utility vehicle. From high-tech gadgets, including entertainment features that'll keep the kids distracted, to an extended-length (EL) body style option that provides the utmost utility to families, this SUV covers all bases. 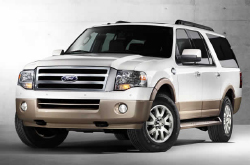 You can find terrific deals on the 2013 Ford Expedition in the Phoenix area at our dealership. When you visit Peoria Ford's sales associates can go over all of the OEM incentives currently available to you. When it comes to large SUVs, few competitors can match the Expeditions combination of comfort, power and utility. And in a segment with fewer options than ever before, the Expedition shines. Last year's Edmunds.com review stated, "[It] has a few advantages over its main rival, including a comfortable third-row seat that folds into the floor and a superior ride quality." Add on the fact that those who choose the new Ford Expedition in Phoenix will get plenty of high-tech features, a cozy and ergonomically designed cabin, and solid towing power, and you've got an SUV that strongly distinguishes itself from others.